OLYMPIA, October 12, 2015 – Three MagnetsBrewing Company begins bottling, will release product in Olympia, Tacoma and Seattle markets. Three Magnets Brewing will start their bottle releases with three beers from their Fresh Hop Series, one beer from their Farmhouse Series, and one beer from the Olympia Coffee Roasters Series. In months to come, Three Magnets will also introduce a Barrel Aged Series and a Chef Series, in which Head Brewer Pat Jansen will craft beers with Executive Chef Kyle Wnuk. Our 2015 Wet Hop Series releases consist of beers made with the same yeast and malts, but with different hops fresh off the bines from Washington farms. Our 2015 Farmhouse Series uses our house saison yeast strains of Dupont, Fantome and Brett Drei, and consists of fresh beer releases and aged beer releases. Our 2015 OCR Series is an ongoing partnership between two award winning craft beverage makers to make the most delicious coffee beers in the world. Just like the fruit bowl on the table, this beer has aromas of ripe fruit such as peach, and grapefruit. Subtle vinous flavours are noticed on the tongue and are quickly followed by the alpha acid zing from copious amounts of fresh, wet hops. Aromas of mango and apricot fill the sinuses. A touch of malty sweetness primes the palate for a slight citrus pithiness that lingers on the tongue, and serves as a delicious reminder of the hop juice you just tasted. Candied citrus coupled with a mild grassy dankness reveal itself to the nose. Grape and berry aromatics are also waiting to be revealed. Sweet citrus flavours wash the palate with flavor to be savored. Fresh Citra flowers are the star of the show here. This modern spin on a Wallonian Grisette is made with barley, oat, wheat, rye and is fermented with our house saison and bret strains. The four malt profiles provide a smooth texture and silky mouthfeel. It is then dry hopped with Brewers Gold and Santiam hops for notes of lemon and spice respectively. We start the series with perfectly brewed Big Truck Organic Espresso and Brimley Stout. We dreamed of the best stout you’ve ever had combined with the best coffee you’ve ever had. We created Big Truck Stout. During the bottle release, all beers will be 10% off bottle purchases, and 20% off of case purchases (can be mixed and matched). There will be an exclusive presale for Supporters Club members between noon and 2pm, with a Supporters Club Exclusive beer. Meet the brewer - Head Brewer Pat Jansen will be in attendance to talk about the beers. About Three Magnets Brewing Co. In 1898, Sir Ebenezer Howard wrote the book Garden Cities of To-Morrow, in which he took aspects of Town living and Country living to create the concept of a utopian city that lives harmoniously with nature (Town-Country). 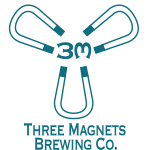 Three Magnets Brewing celebrates his way of thinking, which is exemplified in the Pacific Northwest with our close connections to nature, commitment to sustainable living, abundance of quality meats and fresh seafood, and embracement of community supported agriculture. Three Magnets Brewing Company is a 15 barrel brewery and restaurant located in the heart of Downtown Olympia. Opened in November of 2014, in less than a year the brewery has quickly developed a reputation for clean beers in a variety of styles. The barrel program is set to have its first releases in late 2015.